These cute little babysocks are worked toe-up and give you the choice: ruffles or picot edging? 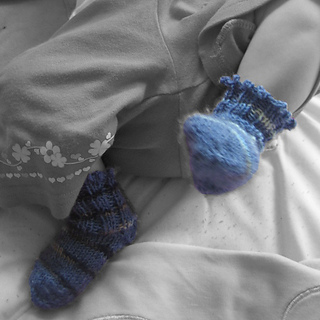 They come in two sizes to fit babies aged 3 to 12 months and are perfect to use up those scraps of left over sock yarn. A fast and fun knit. If you don’t know yet how to make a short row heel, it’s the perfect pattern to learn. Illustrated instructions are included. Skills: Cast on, knit, purl, kfb, kbf, bind off. Süße Babysöckchen, die von der Spitze zum Bündchen gestrickt werden. Für Babys von ca. 3 bis 12 Monaten. Mit zwei verschiedenen Bündchenarten und einer illustrierten Erklärung zur Ferse mit verkürzten Reihen.